is a famous teacher of meditation. He is eighty-seven years old. and lifted him up so that he was seated on its coils. 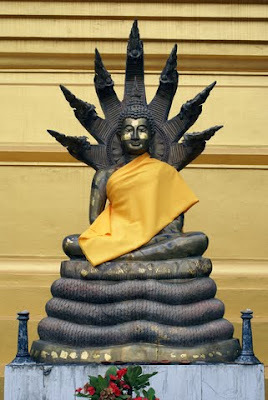 in images of the Buddha. and he could feel his bottom touch the floor again. of the ninth lunar month. and a helicopter landed in front of the hut. as was the cloth across his shoulders. and carried a three-stringed violin. and, when he looked, the helicopter had gone too. which they presented to the monk. their seven heads arching protectively over his. He named it Venerable Father of Seven Kings. The image is famous and venerated throughout the country. Copies of it and tear-drop amulets are widely sold. by means of an inner voice. and the voice entered it at its casting. The voice will not particularise. Welcome to a browse through this selection of poems from BAMBOO LEAVES - Poetry in Thailand by the unique English poet-philosopher Brian Taylor. 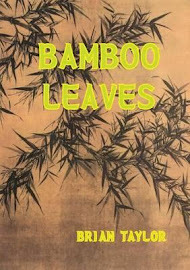 It is a privilege to introduce these poems to you and recommend the book BAMBOO LEAVES - an unusual, masterfully written, insightful, mystical and entertaining read! A visit to Thailand like no other! Note: The images have been selected at the discretion of the editor for website display only and are not part of the original Bamboo Leaves anthology.